Two deputies were treated for chemical exposure after authorities said a woman started spraying a neighbor with ammonia in Deerfield Beach. NBC 6's Steve Litz reports. 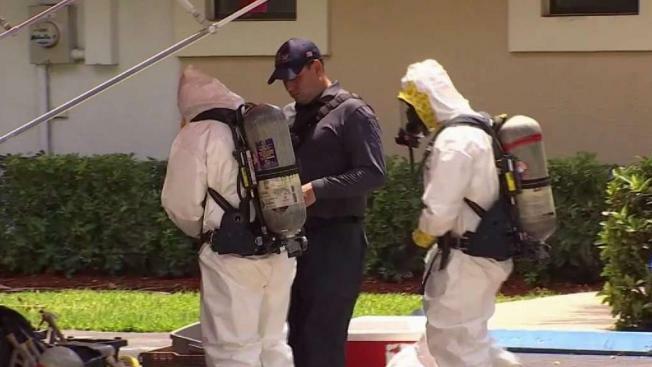 Two deputies were treated for chemical exposure after authorities said a woman started spraying a neighbor with ammonia in Deerfield Beach Monday morning. 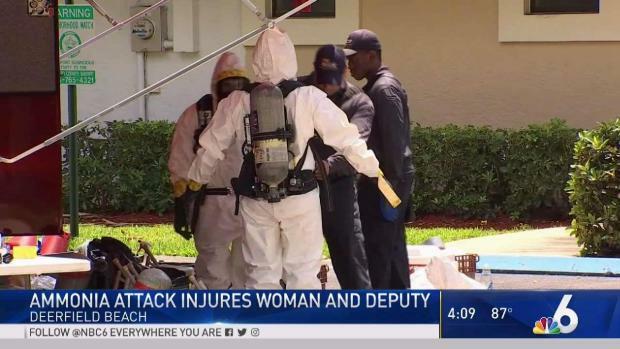 The deputies responded just before 11 a.m. to the 400 block of Northwest 36th Avenue and found the neighbor who had been sprayed with the chemical, Broward Sheriff's Office officials said. One of the deputies who was exposed to the chemical was treated at the scene, but the other complained of a burning sensation to his face and shortness of breath and was transported to Broward Health North with non life-threatening injuries, officials said. The neighbor who had been sprayed was also taken to the hospital. The woman who sprayed the neighbor was taken into custody and was being Baker Acted, officials said. A Hazmat team responded to the scene as a precaution. No other information was immediately known.